Looking for a filling snack because almonds aren't cutting it for you these days? Or maybe you're tempted to have a milkshake but you know it's probably not the best option. Well, when I get to the point where I want something healthy yet creamy and sweet, I just make myself a Tri-Berry Smoothie. I never really measure out my ingredients when it comes to a smoothie but I can give you the "eye-balled" amount. Adjust as you see fit. 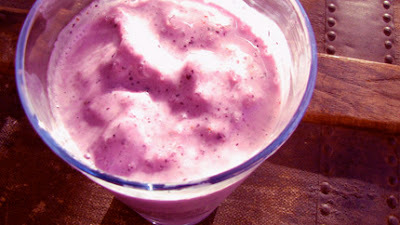 In a blender drop in berries, banana, yogurt and almond milk. Drizzle honey and blend until consistency is thick and creamy, not soupy. If it gets soupy add more frozen berries or a little ice. Have a Happy Healthy Monday! Another birthday, another great year. It seems that my years just get better with time. I fret less because I know I don't know anything and need not to worry about anything. Life keeps going and I go along with it. Seriously, it's so much better when you don't fight the aging process and fight to keep your old habits and ways. For me personally I've accepted that I'm only going to get older so why not enjoy my youth today? Every time I look back I always see how young I was but how old I thought I was and I'm done with that. Soooooo done with that. Hmm *reflective chuckle* I really enjoy this new decade and I do not miss my 20s (sorry but I really don't miss being lost in young adulthood and waking up with hangovers. LOL). I will only really miss the the last part because that's when I got my life aligned and met my husband along the beautiful road. 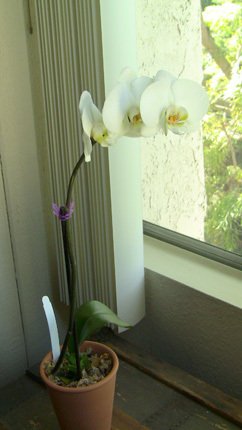 My husband surprised me this morning with an elegant stem of White King Orchids and a lovely card. I thoroughly enjoy receiving unique gifts and he is certainly the man who can deliver such wishes! He is the best and I couldn't be more thankful to God for him. My best and dear friend Lacy also got me a unique gift that can only be understood and appreciated from shared time and experience. I heard this packed thud at the door and a courtesy knock. When I opened the door I looked down to find a white box with stickers certifying the box through the Florida department of agriculture. When I opened the box I was greeted with the fresh scent of Honeybell Tangelos from Harvey's Groves! 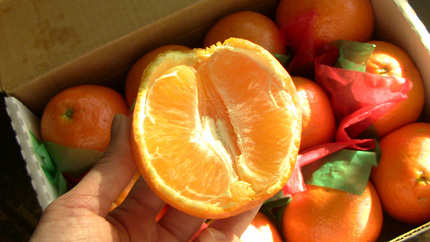 Juicy & Tart! 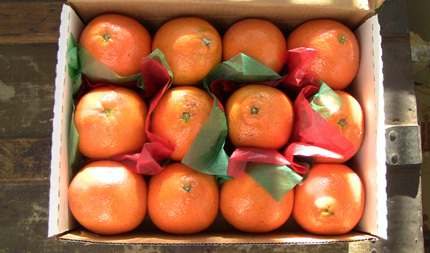 Just the way Floridian oranges should be. So thank you to all my family and friends for making this another memorable year. I've got a good feeling this will be a great year for all of us. Go Year of the Rabbit! Yes, tis the time for Spring and Summer and all it's frivolities in comfy sandals and what nots. So to add to the joy of enjoying the sun may I suggest a little fragrance? Photo from Nordstrom, buy here if you wish. The notes that stand out to me would be the violet, musk & plum. To me the Daisy parfum smells vintage yet modern. Yesterday I had the chance to smell the Eau So Fresh and the hint of vintage is soften and the fruity florals are heightened. I wore it on my right wrists all day and night just to test it out. It's not a parfum but it did last for quite some time. Tip: When fragrance shopping always give yourself time to test skin chemistry before purchase. Use as much surface of your wrists, elbow and arms to spray at most three scents in different locations. Keep it on for a couple hours before you decide what works best for you. Trust me, I tried on Dolce & Gabbana's The One with my girlfriend a while ago. A couple hours later mine smelled sad and almost sour, but my girlfriend's skin smelled like the perfect palette for The One. Lesson learned, moving on. So the next time you visit the fragrance section of Macy's, or the mall of your choice, make sure you stop by and get a spritz to see if Daisy's Eau So Fresh is the one for you! I really hope it is because it will make for a memorable time. High fashion ads can be a bit awkward at times but who wouldn't want a pinkish horse and huge bottle of Eau So Fresh! Sign me up! What kind of cake do you design for a husband that likes video games but your cake skills are beginner level? 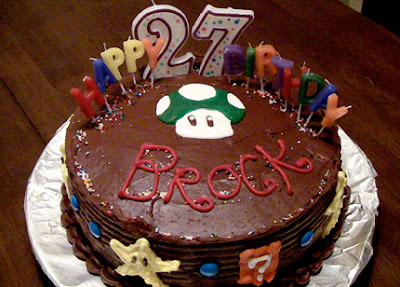 A Mario theme cake of course!! The characters are quite easy to recognize if you have the basics in place and let's face it, Super Mario games are iconic and classic. I still like playing the old school 8-bit Mario games, brings back incredibly fond memories of my childhood. 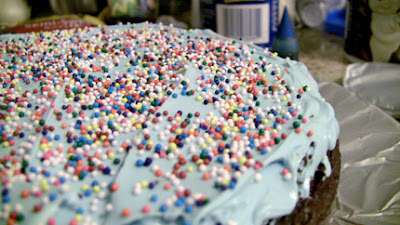 Anyway, I box-caked it this time with a double chocolate cake, chocolate fudge frosting with light blue vanilla middle filled with bright sprinkles for texture that I know my husband truly enjoys. As for the designs I used a cupcake designing tube and Betty Crocker Easy Squeeze icing tubes. What a blast and what a mess. Haha. The star turned out cute and textured, my 1-Up mushroom turned out perfect (in my happy opinion) and do you see the Question mark box? 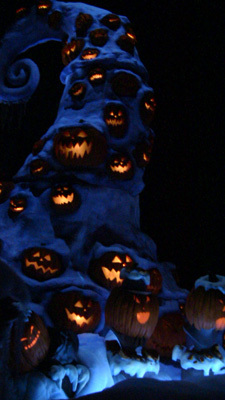 *Smile* It was so fun making it and enjoying it. Happy Birthday Babe add a another year of goodness with this 1-Up Mushroom. Happy Friday to you and have a great weekend! I'm a huge fan of comfort food if you haven't noticed my food posts. 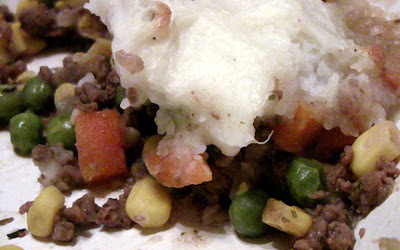 And what more comfort does one need when it comes to a hearty Shepherd's Pie? I mean ground beef and potatoes baked together in savory spices? Killer! Well here is my recipe for Scrump-Delicious Shepherd's Pie and I hope you enjoy it as much as my husband and I did. In fact, we liked it so much that I forgot to take a picture of the whole pie. By the time I remembered we were down to a meager leftover size...more like an appetizer. Mashed Potatoes: simple recipe of three potatoes peeled, cut and boiled until fork-tender. Drain potatoes. Add some butter, salt & black pepper to taste and a couple splashes of milk. Adjust ingredients to suit your taste. Preheat oven 400 degrees. Heat vegetable oil over medium high heat. Saute onions until tender, add garlic. Don't let garlic brown. Add beef until browned. Then add corn, peas & carrots, rosemary, thyme, parsley, dark soy sauce, bouillon, salt and pepper. Mix well. Add wine and keep stirring until liquid is reduced. 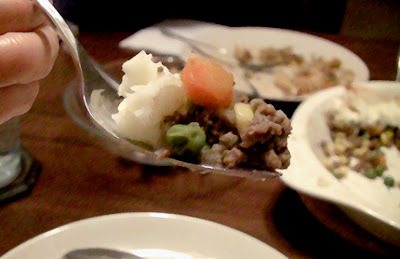 Pour beef mixture into pie pan and cover mixture with mashed potatoes (ahh looks like a meringue pie). Bake in oven for about 25-30 minutes, some browning on mashed potato peaks will do just fine. Serve with Love and Pride. It's Not The Size That Counts...Or Is It? Ah yes, I just saw an advertisement for David's Bridal gowns on sale for $99. I get the sense that it's bridal planning time in America! Of course it is, how could it not be when my three girlfriends are getting hitched this year starting early summer. My goodness I'm getting bridal fever with them. Lately I've been looking through photos of wedding cakes, not that I'm going to be asked to make one but just because I have an itch to work with fondant and maybe think of making a bridal shower cake. Who knows. But last night took me into another world of wedding cakes...HUGE wedding cakes that make Wilton's 80's cakes look like preschool UFOs. With cakes that large I hope they taste just as good. Actually come to think of it, with cakes that large I would love to plop my entire body on it and just enjoy confection all over me (getting carried away now). Well, here are a couple pics and the sites I found them on. 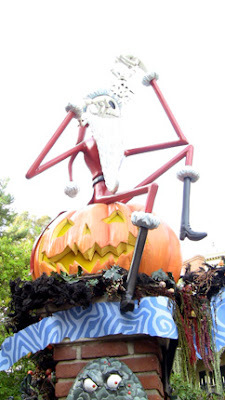 I hope you don't waste as much time as I did mesmerized by such creations on their respective sites like Tackyweddings.com. 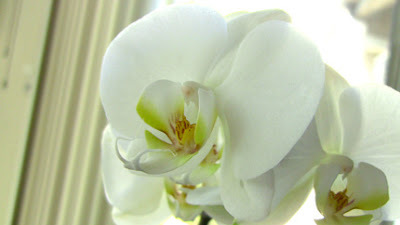 What an amusing blog and what interesting tastes that only two people, who are truly and madly in love with each other, would agree to have in their wedding. I feel my wedding so plain in comparison to them. I'm staying for the after party if there's anymore cake left because the best part of weddings is the cake, or at least I hope it's the cake. I mean this in the nicest way, check out how far this couple took their theme of red and white here. The title says it's "ugly" and so forth but I say to each couple their own! Okay, the guy in the middle has plenty of photos next to giant cakes, I'm thinking he's a well-known baker that's yet to get his own show on network TV. We'll see. I like to call this the Pier One Pillow Cake. It's the ornate pillows I never understood why people pile on their beds for. Found this on Deep717 blog. And here's our guy once again. What a lovely cake, would you agree? Reminds me of the 80's cartoon I used to watch called Rose Petal Place. This would've been perfect for opening night of this tv or movie, I don't remember. Gorgeous nonetheless. Found this pic and more of his creations on Emailjunks.com. It's not the size that shocks me anymore but the cost. 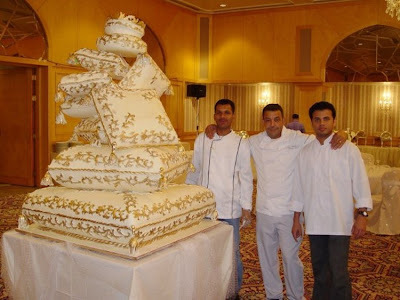 This cake according to the azcentral.com article costs $50,000 and took two months to "bake". Read more here. What sweet bliss and Benjamins! Another reason why Asians are cool. This is not from the Transformer series, this dude is SDF-1 from the Super Dimension Fortress Macross anime series, also known in the States as Robotech. 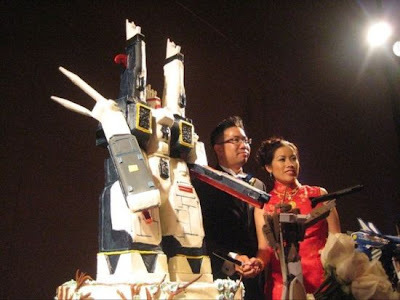 I would confuse you to try and explain what and who it is, so read more about the cake and couple here at Walyou.com. Last but never least, this picture was the inspiration for my blog today. 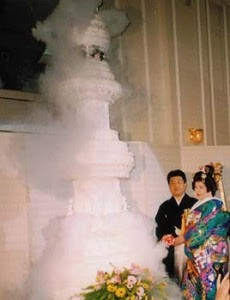 This couple really knows how to make something Godzilla-big and awesome! 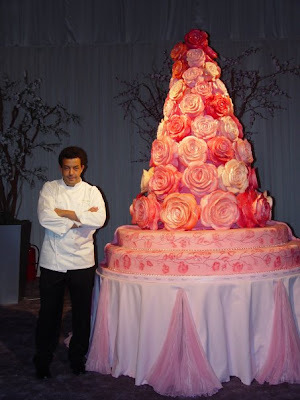 Found this on weddingcakes.com. It kind of reminds me of my sister's wedding cake in Thailand. 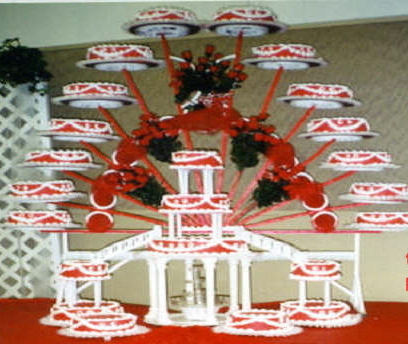 It was 10 tiers and as I recall the cutting knife was about 4 feet long. 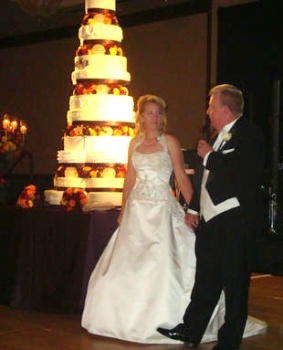 It was extreme but the fresh flowers around the cake the entire ballroom distracted us from the enormity of it all. Anyway, hope you had as much fun as I did looking through these websites in search of large and unusual cakes that proclaim matrimonial bliss. Now back to the kitchen and learning how to make fondant and buttercream! My first time having Challah bread came in the form of french toast and it was delicious. My girlfriend Heather and her husband invited us for breakfast and seeing how my hubby liked it, I kept it in my food memory bank! Well, this past week I thought it was a great time for making Challah bread and I found plenty of recipes of how to make this bread. So it's up to you if you want your bread with more eggs or less eggs, more sugar or less...you choose. When I embark new foods, I usually read a couple recipes available online or in books and then take what I like from each of them and come up with what I want to eat. Sometimes it changes the entire recipe but most of the time it just enhances it to my liking. 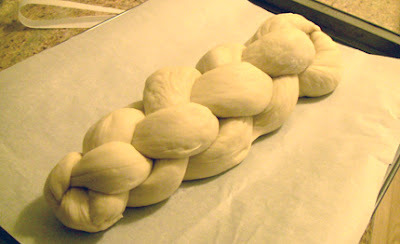 Here are some Challah bread recipes I found online that were quite helpful: Challah I and Smitten Kitchen Best Challah. When it comes to braiding, the best diagram and instructions I found was on thesecretofchallah.com and this is the link for the braiding instructions. Now I don't pride myself in being the best braider, it's rather frustrating but with the instructions from this site I think I did a pretty good job. 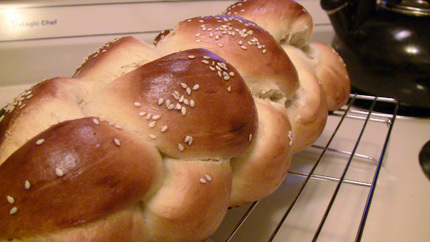 Have you made Challah bread before? What's your style of braid? Got any pics you want to share on this? Thefulltimewife@gmail.com. The best way to celebrate the new year for my family will have to be spending the day at Disneyland and DisneyCalifornia Adventure Park. The weather was perfect. 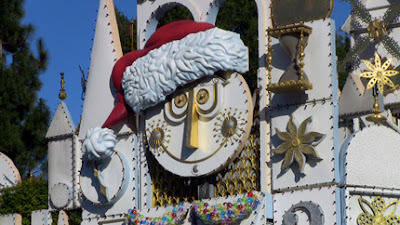 There was just enough sun and crisp coolness to enjoy the not-as-long wait in lines and still be surrounded by holiday decor and cheer from Christmas. My husband and I traveled to Fantasyland where we took flight with Peter Pan, re-read Sleeping Beauty's story in the castle and sang Jingle Bells as we floated through It's a Small World ride. 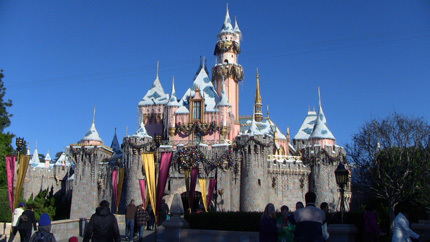 After that we took a train back to Main Street, U.S.A. where we indulged in some rich hot cocoa and french vanilla cappuccino. It was so yummy and felt like the cup never ended...I don't know, must be magic in the brew. 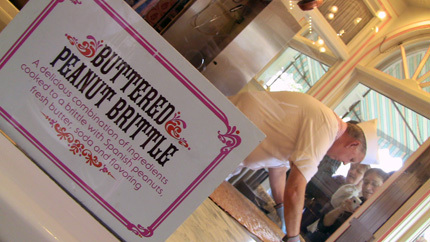 We walked across the street to the candy store and was amazed as we observed a gentleman create peanut brittle. 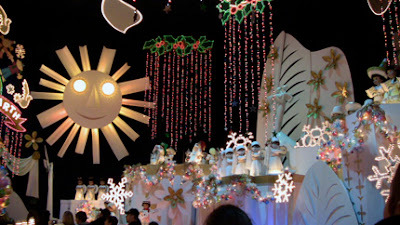 It was as if we were watching a taping of Food Network's Unwrapped right before our eyes! 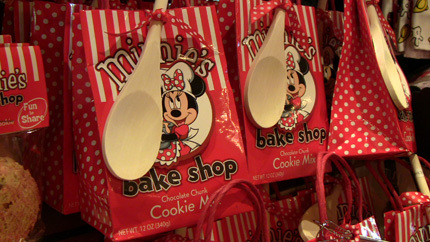 Behind the store there were rows and rows of Minnie's bake shop products. As lunchtime came around we journeyed to Tommorwland where the place wasn't as decorated but we did get a thrill on Buzz Lightyear Astro Blasters ride as we defeated the evil emperor Zurg. Taking commands from Cpt. 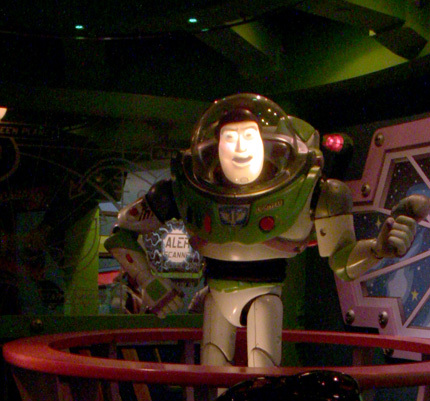 Buzz Lightyear. 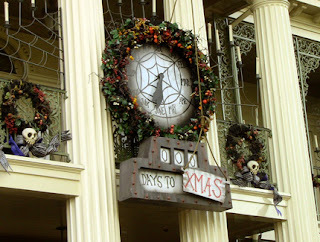 After a quick and pricey lunch at Redd Rockett's Pizza Port we wanted to see what Disney's California Adventure park was like so we headed over there till close. Now I don't have great pics from that park but I will encourage anyone from here on out to NOT miss the World of Color show. 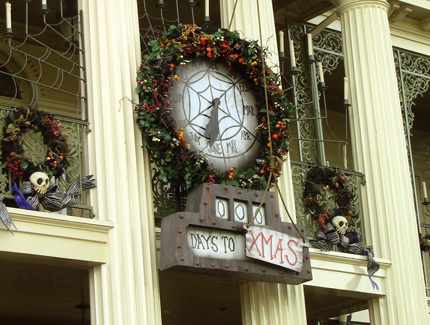 The key is to get your Fast Pass (that's free) near the Grizzly Run Ride before noon if possible. The tickets disappear like hot cakes for all the show times. We didn't know what to do since it was our first time so we stayed for the 10pm show and waited till they lifted the ropes and found a great spot near the "reserved" seating area. 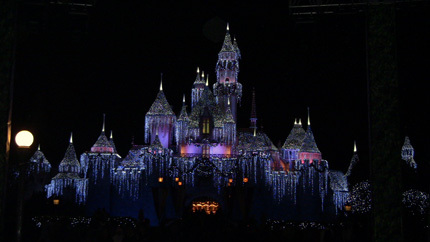 It was worth the wait and it's a must to see World of Color!